Colorbond Metal Roof sheeting is one of the most attractive, versitle, and durable products on the market to enhance your home. With a wide range of styles and colours that suite any roofing need, Colorbond is strong, durable, looks great and will stand the test of time. Corro is fast becoming one of Australias preferred roofing and cladding solutions. With a sleek look that projects versatility from contempory sophistication to heritage simplicity. Enhance your building with Trimdeck and Kliplock for the low pitched roofs, contemporary, commercial and industrial applications. Colorbond products have an oven baked finish that resists rusting, paint peel and fading with warranties up to 30 years. 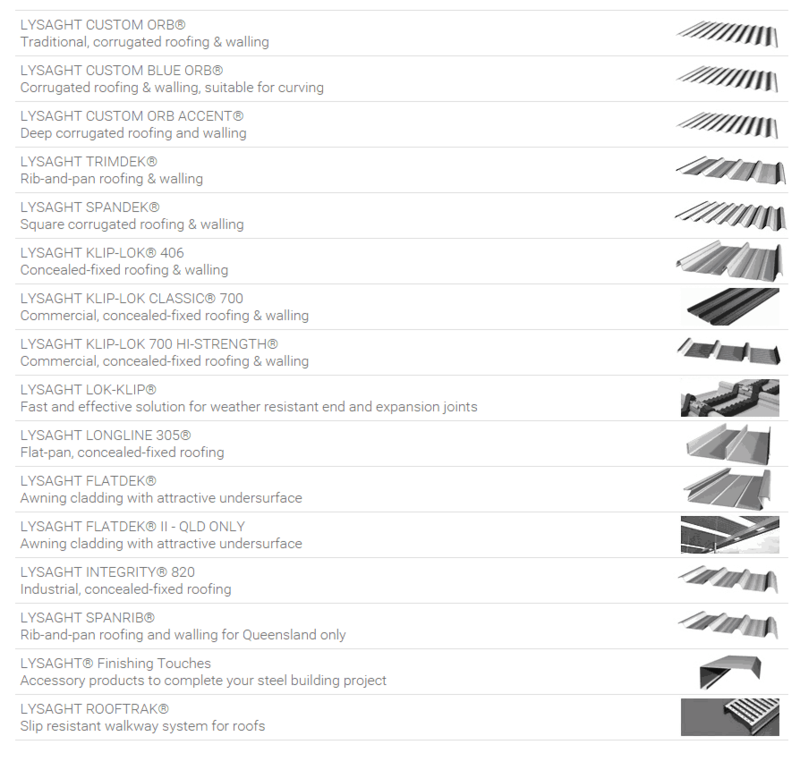 The LYSAGHT® Roofing products are available in a range of profiles such as CUSTOM ORB®, KLIP-LOK 700 HI-STRENGTH® and TRIMDEK® meaning there’s a roofing profile to suit every building application and style – residential or commercial – federation or contemporary – providing flexibility in design opportunities. All our profiles are manufactured from genuine COLORBOND® steel and ZINCALUME® steel. ARC Metal Roofing offers a Free Roof Consultancy Service to help you create the perfect style of roof for your home. Making the right decision on which colour to choose can be quite overwhelming. To help you make the right decision we always suggest that our clients become familiar with the free online colour visualizer that is available by clicking on the image below. 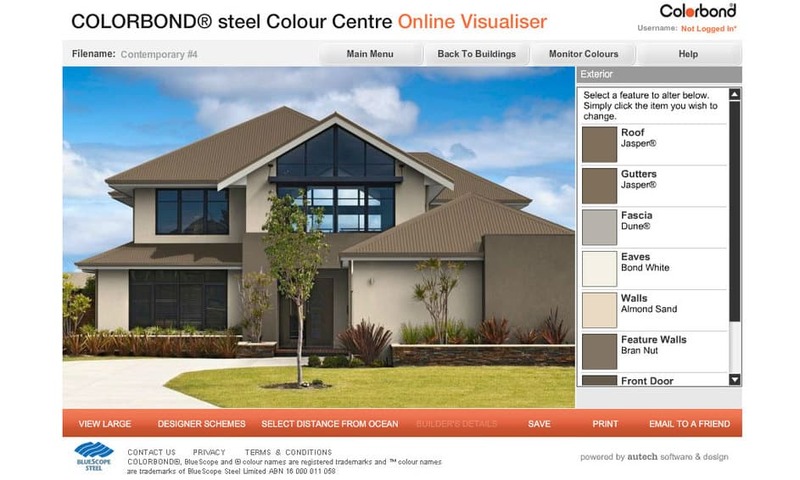 The great thing about this online colour visualizer is that it gives you ability to choose your favourite colours and design before starting your building project. Follow the directions, you’ll be able to choose from 13 different styles of home, then simply select your preferred feature and colour selection on the house style that is most appropriate for you. The location of your property can give you some great inspiration for the colour of your new roof. City based properties draw from the steel greys, silver and charcoals. Whereas the countryside gives preference to the soft blue/greys and deep eucalypt greens. The coast offers the teal, aqua and sandy tones on the blue coastal waters. Please note that colours may vary depending on your screen. You can order swatches for delivery to your home, here.